This is a poster made by the Black Panther Party, the International Liberation School, and the National Committees to Combat Fascism in order to advertise the conference occurring in Oakland, California. BGSU Jerome Library, Browne Popular Culture Library, William F. Ringle Collection. MS-33, Box 23, Folder 17. 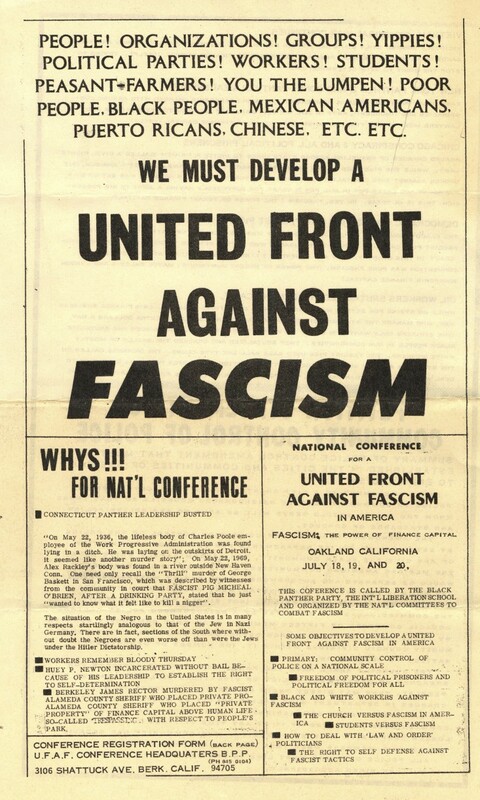 The Black Panther Party, the International Liberation School, and the National Committees to Combat Fascism, “Poster for the National Conference for a United Front Against Fascism,” Student Digital Gallery, accessed April 24, 2019, https://digitalgallery.bgsu.edu/student/items/show/6582.